Endometriosis is a condition where the inner lining of the uterus (the endometrium) grows beyond where it should, most commonly in the ovaries and around the fallopian tubes.The condition affects around two million women in the UK and can cause severe pelvic pain. Endometriosis Awareness Week is organised by the charity Endometriosis UK. The aim is to increase public understanding of the condition and ensure women affected by endometriosis have access to support and information. The link between endometriosis and infertility is not well understood. Sometimes the condition can cause the fallopian tubes to become blocked, but fertility is often affected even in cases where the fallopian tubes appear clear. Other problems associated with endometriosis include cysts on the ovaries and the formation of scar tissue between the reproductive organs. For many women affected by severe endometriosis, their only chance of conceiving will be through IVF. One such couple is Laura and Damion Roberts from Letchworth, Hertfordshire. When Laura was diagnosed with severe endometriosis in 2008, she knew that concieving a baby was going to be more difficult than either of them had previously thought. On Sunday, Laura will be celebrating her first Mother’s Day with little Barney, followed shortly by Barney’s first birthday on March 29th. To mark both Endometriosis Awareness Week and Mother’s Day, we wanted to share Laura and Damion’s story. “I’d always had painful periods, but in February 2008 the pain worsened and it was then I decided to go to the doctors,” explains Laura. “I was referred for a laparoscopy and this showed I had severe endometriosis and ovarian cysts. 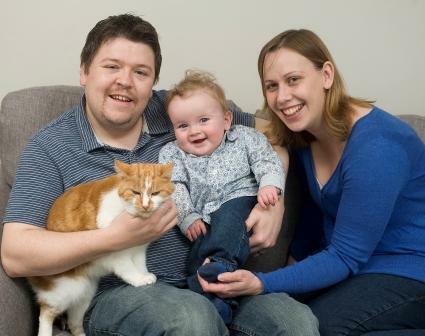 Laura and Damion were advised to start trying for a baby straight away; however by the end of 2010, Laura had still not conceived, so the couple were referred to Bourn Hall Clinic in early 2011. Laura underwent egg collection in July 2011 and five of these eggs successfully fertilised. However, only one embryo developed to the right stage for transfer to Laura’s uterus. Barney was born happy and healthy by Caesarean section on the 29th March 2012. Amazingly, Barney is grandchild number 14 for Damion’s parents, but the first grandchild for Laura’s parents. Bourn Hall provides a range of treatment options – find the one that’s right for you here.